Anaerobic Digestion (AD) is the biological degradation of organic matter in the absence of oxygen. By-products include biogas, which is comprised of approximately 60% methane and 40% carbon dioxide, and digestate. Digestate can be separated into liquid and solid fractions in order to reduce liquid storage space and target nutrients for different crops. Unlike composting, the volume of the input feedstock is not reduced by any appreciable amount during the anaerobic digestion process. Save costs on chemical fertilisers. Spreading digestate will increase crop growth, by returning nutrients and trace elements; especially in the short term when it is needed most. Unlike raw farm manures there is no need to add water. Destroy virtually all disease organisms and weed seeds. Reduce the polluting power (BOD) of the organic material fed into the digester by as much as 80%. Eliminate obnoxious smells. The digestate has only a faint tarry smell, allowing it to be spread without complaints. Captures ammonia which otherwise would have been wasted to atmosphere. Captures methane, which is 20 times worse than CO2 in its contribution to global warming. Fully stabilise separated digestate, which may be stored for long periods without any putrefaction or crusting. This allows spreading on to growing crops at a reduced cost, along with reduced nitrate pollution of water courses, through more effective control of nutrients to land. This enables faster re-grazing, typically within 2 -3 weeks. After digestion and separation of coarse organic fibres you will benefit from increased storage for the liquor by more than 20% as well as having removed all grit, sand and silt in the process. This also has the benefit of not having to mix the digestate store before spreading as no crust has formed on top of the store. 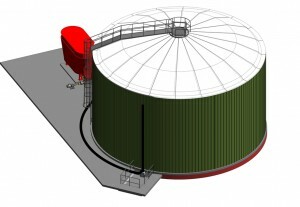 Get answers to frequently asked questions about Anaerobic Digestion. Discover the benefits of the Farm Gas Power advanced Anaerobic Digestion systems.